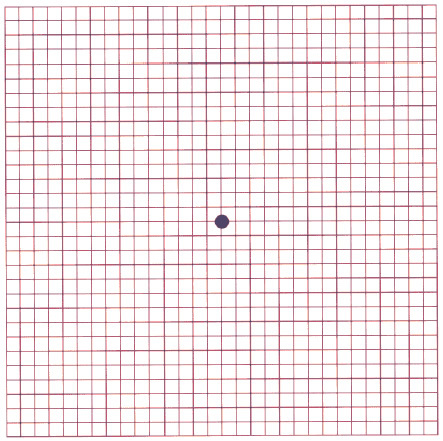 View the grid from approximately 12 to 14 inches away. If you normally wear glasses for reading, do the test with your glasses on. If they are bifocals, look through the bottom or reading portion of the lens. Look directly at the center dot with the other eye. You should be able to see the four corners of the square and that the large square is made up of many smaller squares. If any of the lines disappear or look wavy when you cover either eye, you should call immediately. This could be a warning sign of Macular Degeneration.